The Citizens’ Assembly on Brexit reached its climax yesterday. 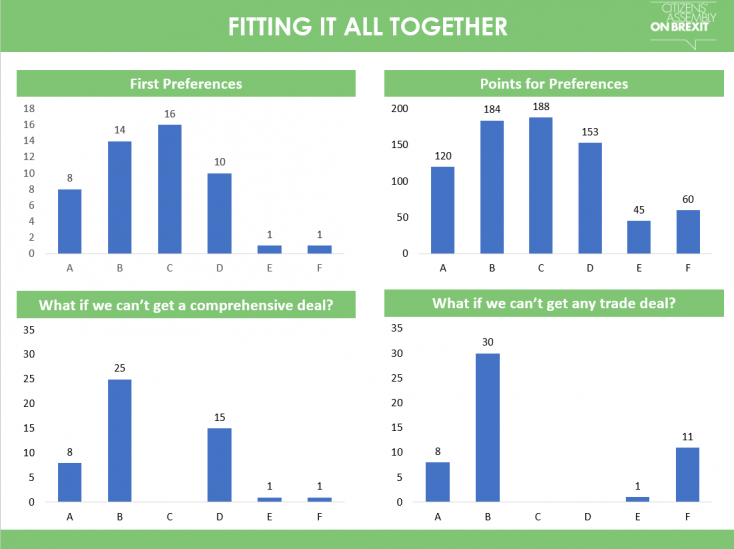 After two weekends of intense deliberation, the members voted on a range of options for the form they want Brexit to take in relation to trade and immigration. Their conclusions will surprise some, and they deserve detailed attention from politicians and commentators. Assembly Director Alan Renwick summarises these conclusions and reflects on the weekend as a whole. 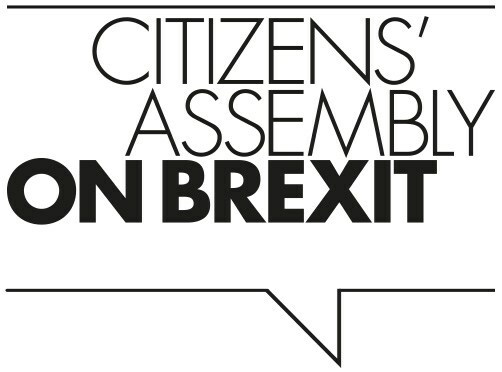 He argues that, while the Brexit debate is often presented in stark binary terms, the Citizens’ Assembly suggests that the British public are capable of much subtler thinking – if only they are given the chance. Dr Alan Renwick is the Director of the Citizens’ Assembly of Brexit, and the Deputy Director of the Constitution Unit. This entry was posted in Europe and tagged Alan Renwick, Brexit, citizens' assemblies, Citizens' Assembly on Brexit, EU customs union, EU single market. Bookmark the permalink. I don’t indulge hopeless hand-wringers. The name of the Constitution Unit implies a concern for constitutional matters. The content of the site indicates extreme bias in favour of the EU and intolerance of other views which are habitually dismissed as those of uneducated, ignorant and less than honest people. This is not prejudice but observation. I have in the past made constructive informed and accurate criticisms and the result is usually abuse by Remainers. Paul above (I do not know who he is) is a rare exception. The issue has been decided. UK is leaving. Unfortunately what is now happening is nothing to do with the merits or otherwise of leaving the EU. The Government, insofar as it seems capable of conscious deliberate decision-making at all, is allowing UK to be pushed up a blind alley of some sort of ill-defined ‘Transition’ which constitutionally and legally, the EU may not be able to agree, and which would be worse than ‘No Deal’ for UK. Divisions in Government render UK weak and open to exploitation by the EU, which is utterly ruthless. Dissent in the media and active opposition by various groups in UK are other vehicles by which the EU undermines the UK government. If there is a constitutional issue worth addressing it is what can be done to strengthen the government’s position in order to ensure it has all the necessary support and power to pursue UK’s interests and to protect the country from the predations of the hostile power that is the EU. That is the reality. With very few exceptions commentary on this web site undermines the Government’s negotiating position. You have now changed your position of wishing disaster upon UK to ‘wishing disaster upon those who are steering it towards what I believe is disaster’, by which you mean Brexit. You lack logic. Disaster for those trying to get the best Brexit deal for UK would mean disaster for UK. I don’t wish disaster on this country, only on the plans of those who are steering it towards what I believe is disaster. But I am listening, Peter D Gardner, and you are not. Try reading the rest of my post. Try thinking outside your prejudices, as I am trying to think outside mine, as I look for a way out of this mess. We do not yet recognise thought crimes in this country. By my actions, not my instincts, you should make judgements. Try and think past your instincts and prejudice. Listen to some rational debate (the Assembly) and try and engage with it rather than dismissing it. Daniel Monks, The fundamental issue is about motivation however it it is dressed up as constitutional, legal or moral argument. You have explained yours openly as ‘wishing that Brexit either won’t happen or will be a disaster.’ What are we to make of people who wish disaster upon their country? I hope you would say we should not listen to them other than in order to find ways to defeat them. I write as a committed remainer, still very angry about the referendum and wishing that Brexit either won’t happen or will be a disaster. But I wanted to respond to Dr Gardner’s attempts to rubbish the Assembly. I found the results set out in Alan Renwick’s report quite unpalatable at times, but read them with pained interest. They are at least a repudiation of the shallowness of the referendum debate and the failure of both the Government and Parliament to really engage in a grown-up discussion of the consequences of that ill-advised vote. The country is split 50:50, the aim of politicians should be to reunite it, not alienate one or other half. Zealotry is not what we need now, and deafness to the complex, multi-layered, ambivalent and contradictory wishes of the “people” is a recipe for disaster. Instead of seeing in every attempt to capture that complexity a conspiracy, it would be better if he used it as an opportunity to examine his conscience, and think about routes to reconciliation rather than aggression and abuse. It is a marvellous thing that 50 people gave up two weekends and more to examine these issues; it is heartening that they seem to have managed to debate them in a spirit of mutual respect; and wherever we stand on the dogmatic issue, we would all do well to think about whether they offer a road to peace. Very interesting stuff, though it’s a bit disappointing for me that a research method best suited to qualitative data production and analysis has been analysed with such quants-minded methods, related charts and even an emphasis (very questionably appropriate) on representativeness. Still v. interesting though! This is in response to Peter D Gardner’s posts of 2 October to which I am unable to reply directly for some reason. As a participant in the assembly I would like to answer your concerns regarding our discussions on trade. On the first weekend we were visited by four economists who were each given the same length of time to present their opinions, beliefs and what they felt to be relevant statistics to the group. They then spent a further period, on each separate table of assembly members, answering questions on their own presentations and those of the other speakers. Two of the four (Dr Thomas Sampson and Dr Angus Armstrong) argued for the UK to remain in the SIngle Market; the other two (Shanker A Singham and Professor David Paton) emphasised the potential benefits of leaving in regards to the opportunities presented by making trade deals globally if we were to exit the Customs Union. Certainly the topics that you mention in your post of 2 Oct at 11:09pm, including opportunities in growing markets outside the EU and the UK’s declining share of trade with the EU, were both covered and indeed pressed quite strongly by both Shanker and David. It is, of course, impossible for any group of 50 citizens to resolve, in two weekends, an issue which will take Governments and officials years. Not every potential opportunity or pitfall can be examined in microscopic detail in such a timescale and I am sure that many involved will be able to come up with further questions and arguments both now and over the coming months. The end of the assembly process is clearly not the end of the debate. 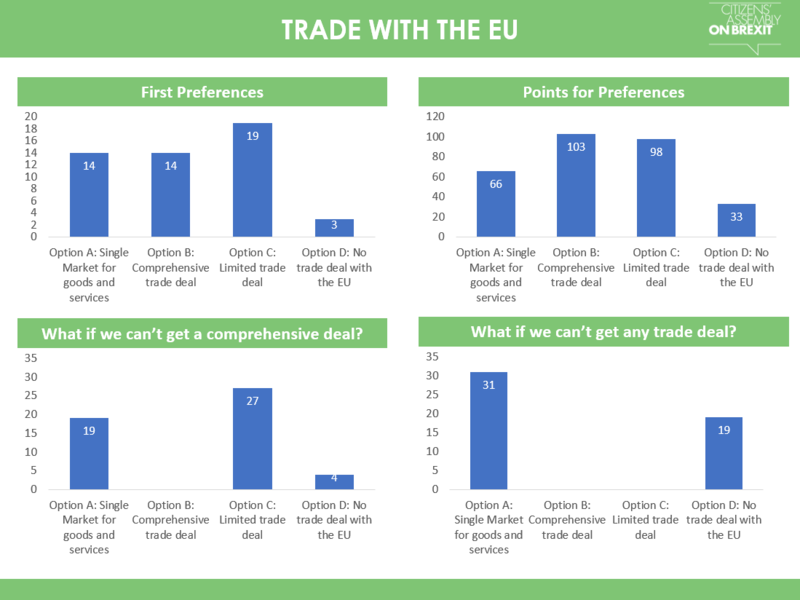 The results only partially reflect my own opinions and who knows whether we would get the same result after another twelve months of negotiations have taken place? Nevertheless, whatever anyone may feel about the conclusions, it certainly seems to me that the findings were in line with the opinions expressed by the participants over the course of the two weekends and therefore they are nothing if not an accurate reflection of the general feelings of the assembly at the end of the discussions. Your arguments are valid and a welcome addition to the debate. The final sentence of your 1.30pm post less so. The situation regarding coffee revenue in Germany v Africa was certainly mentioned as part of the argument in favour of leaving the Customs Union and setting our own tariffs. Although Sovereignty was raised there was no real time to discuss matters such as plans for further integration both politically and economically, nor of the relative merits or otherwise of the EU method of governance, as the weekend was based around the idea that we are leaving the EU and therefore the direction that body goes once we have left is not a matter for the UK. I think you mean carefully guided towards a Remain stance. The government went so far as to produce a deeply dishonest treasury report that destroyed the treasury’s reputation for impartiality, and produced a biassed and misleading brochure in favour of Remain and still failed to persuade 52% of voters. What more information could people possibly want? Something about the future development of the EU perhaps, the effects of its barriers to trade with African and other developing countries. Did you know Germany makes more money from coffee than the producing nations because the raw materials are imported free of tariffs, yet value added products face very high tariffs. In agriculture as high as 32%. Why? To protect moneymaking by inefficient European industries. What other information was denied? The EU’s plans for a single treasury, submission for approval of national budgets by the EU commission before national parliaments, alignment of national political parties with EU parties and vetting by the commission? the Five Presidents report published in June 2015 and the subsequent white paper in Spring 2017? Was any of that presented in this guidance that so impresses you? So how many of you actually read the EU Treaties, or any of the EU directives in the pipeline, or that on Clinical Trials (issued and enacted), Ports, Jurisprudence? I’ll bet very few and I’ll bet neither was it presented in the assembly by these highly informed leaders. I don’t know but please show me I’m wrong, if you can. Oh and was any evidence given for the superiority of technocratic supra-national governance over sovereign parliamentary governance? Highly informative. The difference between this group and the electorate is that the group’s decisions were guided by an informed debate. So, Westminster continues to play dangerous games. It appears to be a political cliff edge as well as an economic one. We live in interesting times. Of course you do. You write anonymously. Speaking of facts, tell me the facts of the assembly’s work that would support some expression in trade policy of an optimistic and confident view of UK’s future trade with the world. What was said about increasing exports, creating wealth and so on that I did not find in the report, which one would reasonably expect to find in any discussion of what is needed in a trade policy? What was said about the opportunities in he growing markets outside the declining EU? What was said about the UK’s declining share of trade in the EU, itself declining in terms of world trade? What was said about a possible objective to ensure UK can and does engage with the growing part of the world? What reasons were given in the assembly for excluding such a policy objective? Note: the assembly was supposed to be addressing what they wanted as trade policy objectives, not prospects for trade. Or did Alan Renwick mis-represent that in his article above? Hi. The Assembly members were selected to reflect the UK electorate. They were selected on the basis of 6 stratification criteria, region (North, South, East of England, London, Wales, Scotland, Northern Ireland), ethnicity, age, social class, gender and vote in the referendum. As a member of the assembly I find your comments very derogatory. How can you have such an opinion when you have no clue about what discussions took place over the weekends? How do you know that we suffer a lack of confidence in ourselves? Maybe do a bit of fact finding before spouting your very biased opinion. I am surprised increasing UK’s wealth was not a priority objective of UK trade policy. Nothing at a strategic level, eg securing energy supplies, nothing about exploiting UK’s own resources, eg fishing, shale, UK’s EEZ, nothing about growth markets in the world, nothing about countries seeking trade relationships with UK, nothing about the USA or Canada. The common factor was protection of one sort or another. Fear of competition. Overall outlook: negative, preference for insularity, clinging to EU for protection against the big bad world, lack of confidence in UK, in themselves, in the government. I wouldn’t want this lot anywhere near government. This is interesting work. The only issue that surprised me was the views on Immigration outcomes. I note that the group was weighted to reflect the referendum outcome but I didn’t see if the group was balanced by UK geographical location e.g. south east, the North. …I wondered if geographical location influenced respondents views on immigration?